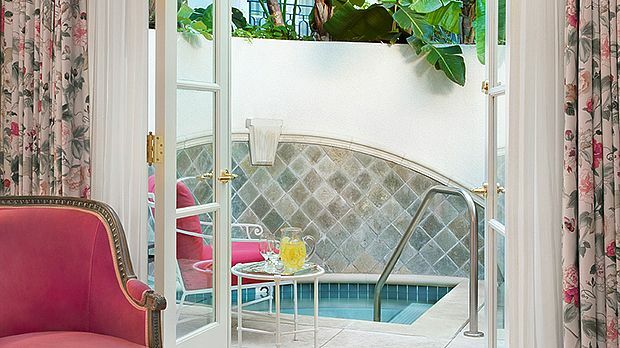 Enviar una solicitud de disponibilidad con las fechas que desee a The Peninsula Beverly Hills. Superior Rooms feature a comfortable seating area and French windows that open all the way to allow you to enjoy views of quiet Lasky Avenue. Room features include a work desk with all-in-one fax/copier/printer, IDD speakerphones and voice mail. The well-appointed marble bathroom features a deep soaking tub and luxurious designer bath amenities. Bedding features two sumptuous double beds with pillow top mattresses, luxury linens and comfortable duvets. These rooms also include accessible facilities. Room amenities include complimentary cabled and wireless Internet access, a hair dryer, mini-bar, personal safe, LCD widescreen HDTV, Blu-ray DVD player, Bose Stereo, CD Player and an iPod dock. Also included are climate control, bottled water and a fruit basket. Maximum occupancy is 4 persons using existing bedding. Rollaway bed is not permitted. All rooms are non-smoking. Some of these rooms can connect to a Superior Accessible Room. 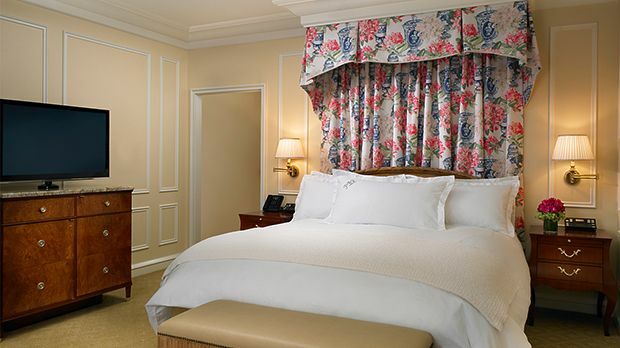 Superior Rooms feature a comfortable seating area and French windows that open all the way to allow you to enjoy views of the hotels interior gardens. Room features include a work desk with all-in-one fax/copier/printer, IDD speakerphones and voice mail. The well-appointed marble bathroom features a deep soaking tub and luxurious designer bath amenities. Bedding features a sumptuous king bed with pillow top mattress, luxury linens and a comfortable duvet. These rooms also feature accessible facilities. Room amenities include complimentary broadband and wireless Internet access, a hair dryer, mini-bar, personal safe, LCD widescreen HDTV, Blu-ray DVD player, Bose Stereo, CD Player and iPod dock. Also included are climate control, bottled water and a fruit basket. Maximum occupancy is 4 persons using 1 rollaway bed on request. All rooms are non-smoking. No connecting rooms are available for this room type. Deluxe Rooms are located in a more quiet location, perfect for relaxation or getting some work done. 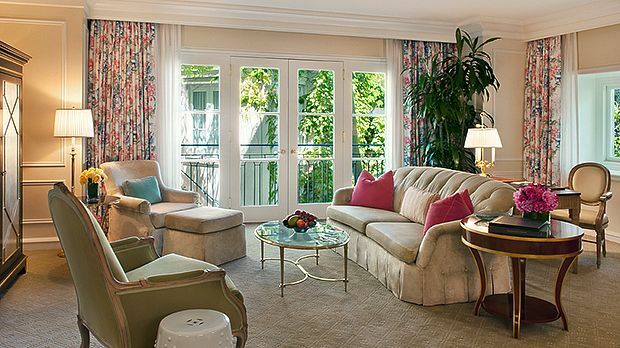 Each room features a comfortable seating area and French windows that open all the way to allow you to enjoy views of the hotels interior gardens, residential Beverly Hills or the mountains. Room features include a work desk with all-in-one fax/copier/printer, IDD speakerphones and voice mail. The well-appointed marble bathroom features a deep soaking tub and separate shower cabin plus luxurious designer bath amenities. Bedding features two sumptuous double beds with pillow top mattresses, luxury linens and comfortable duvets. Room amenities include complimentary cabled and wireless Internet access, hair dryer, mini-bar, personal safe, LCD widescreen HDTV, Blu-ray DVD player, Bose Stereo, CD player and iPod dock. Also included are climate control, bottled water and a fruit basket. 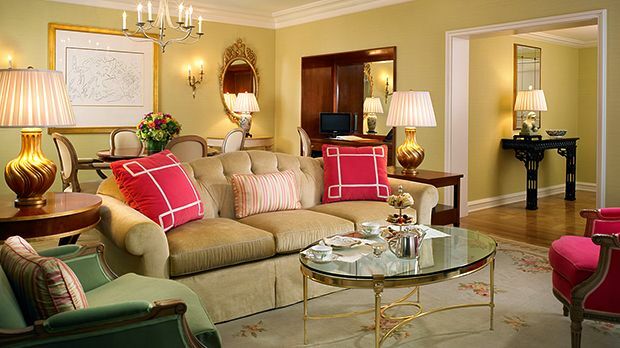 Some of these rooms can connect to a Deluxe King Room or a Deluxe Suite or a Grand Deluxe Suite. Patio Deluxe Rooms are located on the ground floor with views of the hotels gardens. Each of these rooms features a large 80 square foot furnished patio. 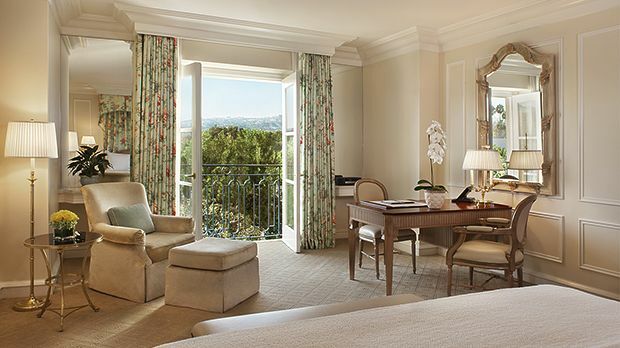 Each room features a comfortable seating area and French windows that open all the way to allow you to enjoy views of the hotels interior gardens, residential Beverly Hills or the mountains. Room features include a work desk with all-in-one fax/copier/printer, IDD speakerphones and voice mail. The well-appointed marble bathroom features a deep soaking tub and separate shower cabin plus luxurious designer bath amenities. Bedding features two sumptuous double beds with pillow top mattresses, luxury linens and comfortable duvets. Room amenities include complimentary cabled and wireless Internet access, hair dryer, mini-bar, personal safe, LCD widescreen HDTV, Blu-ray DVD player, Bose Stereo, CD player and iPod dock. Also included are climate control, bottled water and a fruit basket. 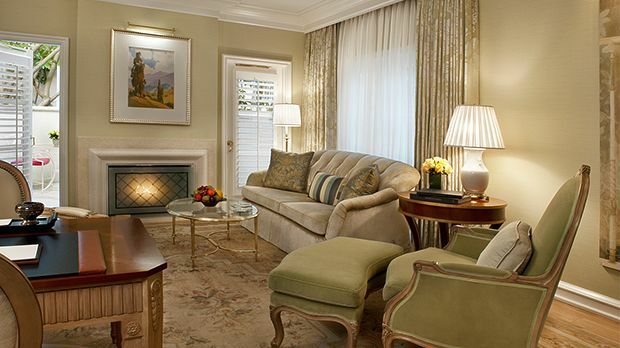 Some of these rooms can connect to a Deluxe King Room or a Deluxe Suite or a Grand Deluxe Suite. 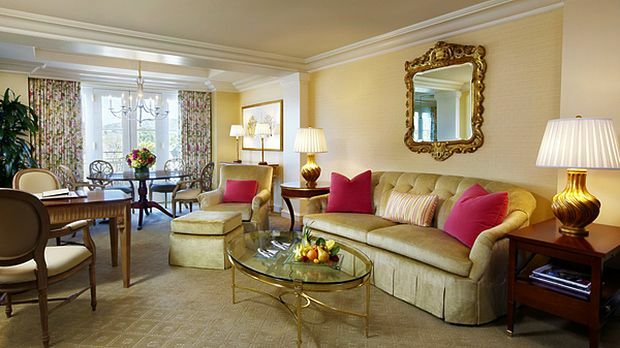 Grand Deluxe Rooms offer a spacious sitting area with a loveseat and coffee table. They are perfect for small meetings or spacious relaxation. 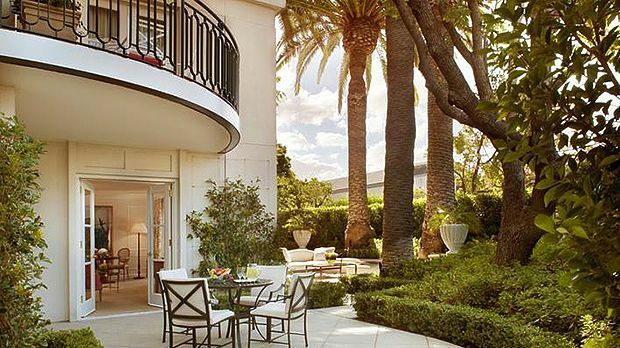 Views are of the hotel's interior gardens or residential Beverly Hills. Room features include an executive desk with all-in-one fax/copier/printer, IDD speakerphones and voice mail. The well-appointed marble bathroom features a deep soaking tub and separate shower cabin plus luxurious designer bath amenities. Corner rooms offer double vanities. Bedding features a sumptuous king bed with pillow top mattress, luxury linens and a comfortable duvet plus a sofa bed. Room amenities include complimentary cabled and wireless Internet access, hair dryer, mini-bar, personal safe, LCD widescreen HDTV, Blu-ray DVD player, Bose Stereo, CD player and iPod dock. Also included are climate control, bottled water and a fruit basket. Some of these rooms can connect to a Deluxe King Room. Villa Guestrooms are large one room bungalow-style rooms located in the Villa Gardens section of the hotel. 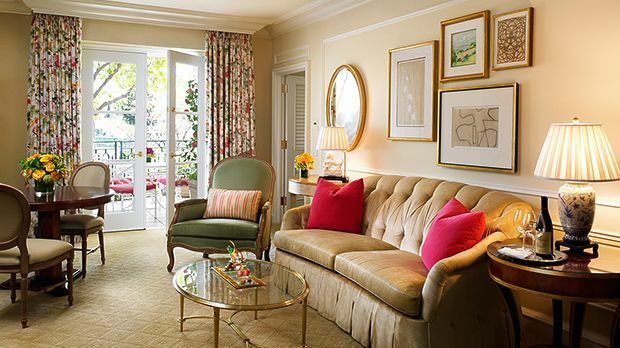 These rooms are exceptionally quiet offering views of the hotel's gardens. Unique features include a patio on the ground floor, walk-in closet and double vanities. Each room offers a large sitting area with a loveseat and coffee table as well as a vanity area and some have a fireplace. Room features include an executive desk with all-in-one fax/copier/printer, IDD speakerphones and voice mail. The well-appointed marble bathroom features a deep soaking tub plus double vanities and luxurious designer bath amenities. Bedding features a sumptuous king bed with pillow top mattress, luxury linens and a comfortable duvet. Room amenities include complimentary cabled and wireless Internet access, hair dryer, mini-bar, personal safe, LCD widescreen HDTV, Blu-ray DVD player, Bose Stereo, CD player and iPod dock. Also included are climate control, bottled water and a fruit basket. Some of these rooms can connect to another Villa Guestroom or a Grand Villa Suite with Kitchen. The unique Executive Grand Deluxe Room offers a spacious sitting area with a sofa and coffee table, perfect for small meetings or spacious relaxation. Views are of the hotels interior gardens. Room features include a work desk with all-in-one fax/copier/printer, IDD speakerphones and voice mail. The well-appointed marble bathroom features a deep soaking tub and luxurious designer bath amenities. Bedding features a sumptuous king bed with pillow top mattress, luxury linens and a comfortable duvet. These rooms also feature accessible facilities. Room amenities include complimentary broadband and wireless Internet access, a hair dryer, mini-bar, personal safe, LCD widescreen HDTV, Blu-ray DVD player, Bose Stereo, CD Player and iPod dock. Also included are climate control, bottled water and a fruit basket. Maximum occupancy is 4 persons using 1 rollaway bed on request. All rooms are non-smoking. No connecting rooms are available for this room type. This one bedroom suite offers views of the city or the Beverly Hills residential area. Features include a spacious sitting area with a sofa and coffee table, an executive desk with all-in-one fax/copier/printer and IDD speakerphones and voice mail. The well-appointed marble bathroom features a deep soaking tub and separate shower cabin plus luxurious designer bath amenities and double vanities. Bedding features a sumptuous king bed with pillow top mattress, luxury linens and a comfortable duvet as well as a sofa bed. Suite amenities include complimentary cable and wireless Internet access, hair dryer, minibar, personal safe, LCD widescreen HDTV, Blu-ray DVD player, Bose Stereo, CD player and iPod dock. Added amenities include climate control, bottled water and a fruit basket. Included with published room rates is the use of an Infiniti luxury vehicle during the duration of the guests stay subject to proof of insurance and a valid U.S.-issued drivers license. Other conditions apply to vehicle use. Contact the hotel to reserve vehicle prior to guest arrival. Some of these suites can connect to another Beverly Suite. 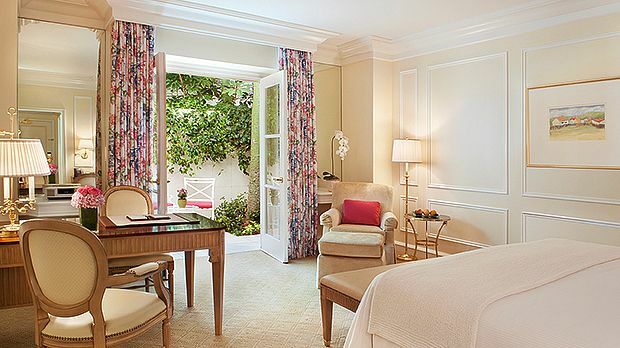 These spacious one bedroom suites offer views of the hotels gardens. Unique features include a corner balcony with a table and two chairs. Room features include a work desk with all-in-one fax/copier/printer, IDD speakerphones and voice mail. The well-appointed marble bathroom features a deep soaking tub and luxurious designer bath amenities. Bedding features a sumptuous king bed with pillow top mattress, luxury linens and a comfortable duvet. These rooms also feature accessible facilities. Room amenities include complimentary broadband and wireless Internet access, a hair dryer, mini-bar, personal safe, LCD widescreen HDTV, Blu-ray DVD player, Bose Stereo, CD Player and iPod dock. Also included are climate control, bottled water and a fruit basket. Maximum occupancy is 4 persons using 1 rollaway bed on request. All rooms are non-smoking. No connecting rooms are available for this room type. Located in the Villa Gardens, these bungalow style suites offer views of the hotel's gardens. Ground floor suites offer a patio. All of these suites feature hardwood floors, a fireplace, wet bar and vanity area. Additional features include an executive desk with all-in-one fax/copier/printer, IDD speakerphones and voice mail. The well-appointed marble bathroom features a deep soaking tub and separate shower cabin plus luxurious designer bath amenities and double vanities. Bedding features a sumptuous king bed with pillow top mattress, luxury linens and a comfortable duvet as well as a sofa bed. Suite amenities include complimentary cabled and wireless Internet access, hair dryer, mini-bar, personal safe, LCD widescreen HDTV, Blu-ray DVD player, Bose Stereo, CD player and iPod dock. Added amenities include climate control, bottled water and a fruit basket. Included with published room rates is the use of an Infiniti luxury vehicle during the duration of the guests stay subject to proof of insurance and a valid U.S.-issued drivers license. Other conditions apply to vehicle use. Contact the Hotel to reserve vehicle prior to guest arrival. 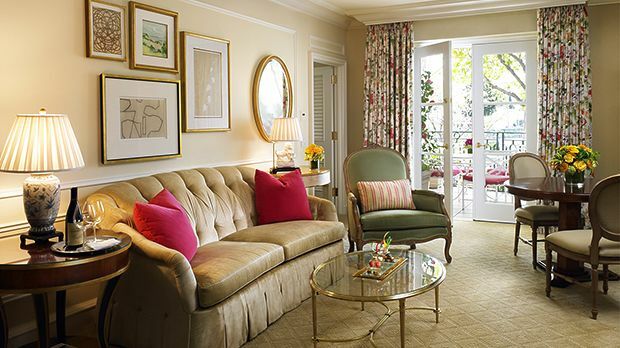 One of these suites can connect to The Peninsula Suite. 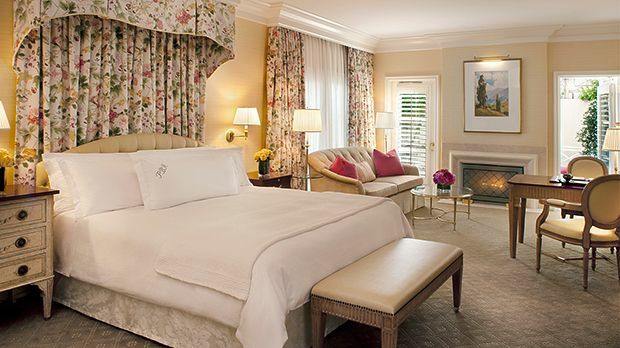 This unique suite features a large 1000 square foot furnished patio with a fire pit and views of the hotels gardens. Other special features include a dining table for 2 in the spacious living room. Suite features include an executive desk with all-in-one fax/copier/printer, IDD speakerphones and voice mail. The well-appointed marble bathroom features a deep soaking tub plus double vanities and luxurious designer bath amenities. Bedding features a sumptuous king bed with pillow top mattress, luxury linens and a comfortable duvet. Suite amenities include complimentary cabled and wireless Internet access, hair dryer, mini-bar, personal safe, LCD widescreen HDTV, Blu-ray DVD player, Bose Stereo, CD player and iPod dock. No connecting rooms are available for this suite type. Features 1 King bed, a private outdoor hot tub, fireplace, wet bar, vanity area, marble bathroom with deep soaking tub, patio, hair dryer, minibar, personal safe, LCD widescreen HDTV, Blu-ray DVD player, Bose Stereo, Wi-Fi Internet, CD player and iPod dock. No connecting rooms are available for this suite type. Features 1 King bed, private outdoor hot tub on a furnished patio, well-appointed kitchenette, two fireplaces, wet bar, large living room, dining table for four persons and a guest washroom. 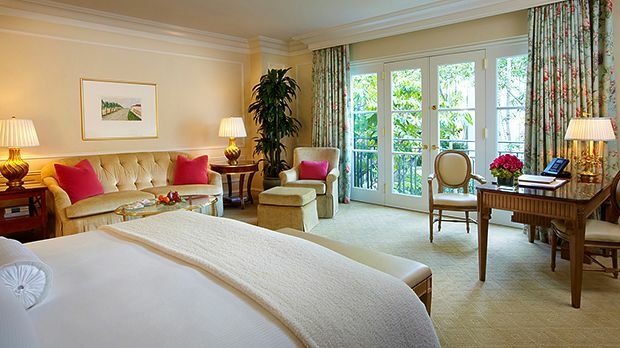 California Suites offer views of the front fountain and mountains beyond or views of the hotel gardens. Added features include hardwood floors, a large living room with a dining table for four persons, a separate guest washroom, wet bar, vanity area and large closet space. Additional features include an executive desk with all-in-one fax/copier/printer, IDD speakerphones and voice mail. The well-appointed marble bathroom features a deep soaking tub and separate shower cabin plus luxurious designer bath amenities and double vanities. Bedding features a sumptuous king bed with pillow top mattress, luxury linens and a comfortable duvet as well as a sofa bed. Suite amenities include complimentary cabled and wireless Internet access, hair dryer, mini-bar, personal safe, 55 inch LCD widescreen HDTV, Blu-ray DVD player, Bose Stereo, CD player and iPod dock. Added amenities include climate control, bottled water and a fruit basket. Included with published room rates is the use of an Infiniti luxury vehicle during the duration of the guests stay subject to proof of insurance and a valid U.S.-issued drivers license. Other conditions apply to vehicle use. Contact the hotel to reserve vehicle prior to guest arrival. No connecting rooms are available for this suite type. Deluxe Suites are located in the Main Building with views overlooking the city or the front fountain and mountains. Each suite features a large living room area, a dining table for four persons, separate guest washroom, wet bar and vanity area. Additional features include an executive desk with all-in-one fax/copier/printer, IDD speakerphones and voice mail. The well-appointed marble bathroom features a deep soaking tub plus double vanities and luxurious designer bath amenities. Bedding features a sumptuous king bed with pillow top mattress, luxury linens and a comfortable duvet. Suite amenities include complimentary cabled and wireless Internet access, hair dryer, mini-bar, personal safe, LCD widescreen HDTV, Blu-ray DVD player, Bose Stereo, CD player and iPod dock. Also included are climate control, bottled water and a fruit basket.